TowBoatUS Falmouth is a fast response marine boat towing and salvage company. We operate 24/7 in Vineyard Sound, Nantucket Sound, Buzzards Bay and up to 100 miles offshore.Our vessels are centrally located in Falmouth Harbor and Cotuit. We are typically on scene in less than 45 minutes. 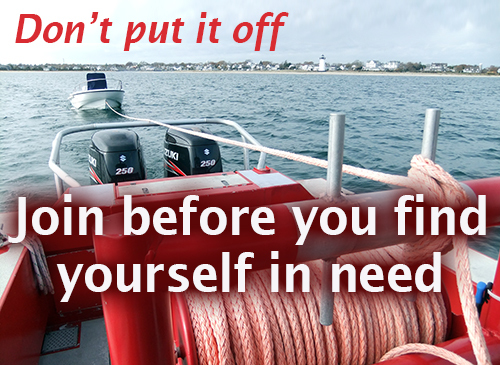 TowBoatUS Falmouth has been providing worry free boating services to BoatUS members and nonmembers since 2002. From runabouts to mega yachts - safe and reliable tows to get you back to your home port or the marina of your choosing. Hard aground or submerged, we've recovered and rescued a variety vessels all along Nantucket Sound and Southern New England. All of our vessels carry gasoline and diesel to get you back to port under your own power. Out of power? Get a quick jump to get you back on your way. BoatUS memberships provide a variety of boating services and savings including the nation’s largest boat towing network. Over half a million Members know it pays to belong.